Three grizzly bears – Mike, Thor and Boo – were found orphaned in Alaska as cubs after their mother was shot and killed by a poacher. The Alaska Department of Fish and Game contacted the Detroit Zoological Society seeking a home for the 10-month-old brothers. 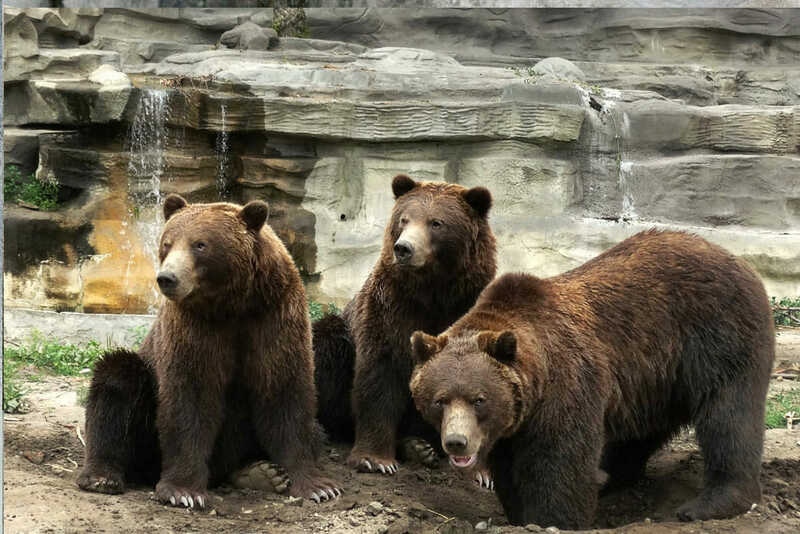 They arrived via FedEx plane and have called the Detroit Zoo home since December 2011. Mike, Thor and Boo engage in playful antics and seem to enjoy competing in sibling wrestling matches; Boo is often the instigator of rough play. The Detroit Zoo is also home to female Kintla, who was relocated twice in the wild before being rescued by the Zoo when she was 2 years old. She was captured by Montana’s Department of Fish, Wildlife and Parks in 1986 after showing interest in the area’s honey industry, frequently “inspecting” the beehives. The grizzly bears can be found in the bear dens in the American Grasslands. Grizzly bears are massive animals with elevated foreheads and humped shoulders. Their coat color ranges from off-white, tan, yellow, brown to black. The name grizzly comes from the grizzled-gold coloration on the tips of the fur as the bear matures. A female grizzly bear will nurse her cubs in the den until they are 2-3 years of age. A grizzly bear is able to smell food that is miles away, and its sense of smell is even better than that of a hound dog. The grizzly bear is an omnivore and eats roots, leaves, berries, squirrel, elk, moose and deer.